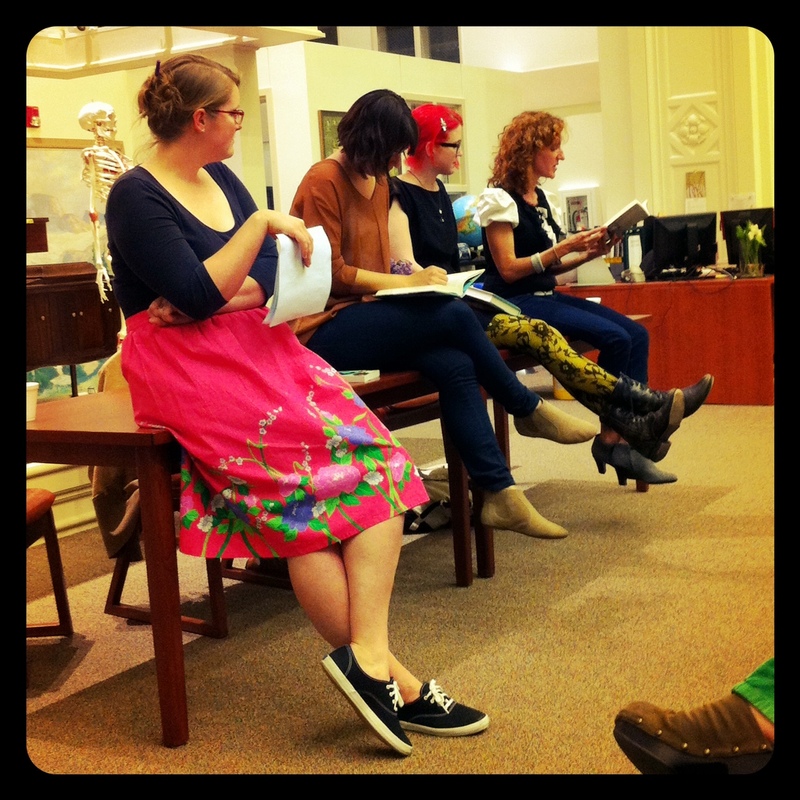 Thursday night I was lucky enough to attend YA or Bust, featuring Gayle Forman (IF I STAY and WHERE SHE WENT), Nina LaCour (HOLD STILL and THE DISENCHANTMENTS), and Stephanie Perkins (ANNA & THE FRENCH KISS and LOLA & THE BOY NEXT DOOR) at Roosevelt High School in Seattle. If you’re a regular reader of my blog, then I don’t have to tell you how much I absolutely adore these authors. If you are new to my blog: I ABSOLUTELY ADORE THESE AUTHORS. Gayle Forman’s If I Stay was the first YA novel that made me think: I want to write a book like THAT. Stephanie Perkins’ Anna and Lola are two of the most perfectly executed YA romances I’ve encountered. And Nina LaCour’s The Disenchantments… Hands down the best book I’ve read this year. On Thursday night I learned that not only are the three authors of the YA or Bust tour brilliant and talented, but they’re also funny and gracious and delightful, all of which probably goes without saying. Nina LaCour talking about the research she did while writing THE DISENCHANTMENTS... literal road trips and lots of eighties girl band footage -- Awesome! Gayle Forman sharing an excerpt from WHERE SHE WENT... I'm about as unemotional a person as they come, but damn it if I didn't have a near-moment while she read aloud from her novel. A few pieces of takeaway advice shared by the ladies during the panel portion of the evening: Read like a writer; pay attention to your strong reactions (both good and bad), then break down what it was the author did to make you feel the way you felt. Take your time learning craft; knowing how to ice skate isn’t the same as knowing how to throw a Triple Axel — writing a novel is no different. Bird by Bird is the way to go. Understand your characters; get to know them by describing their living space, the things they carry, the way they look, the way they interact. And finally, pay attention to detail, especially during the researching/revising/editing/querying processes. 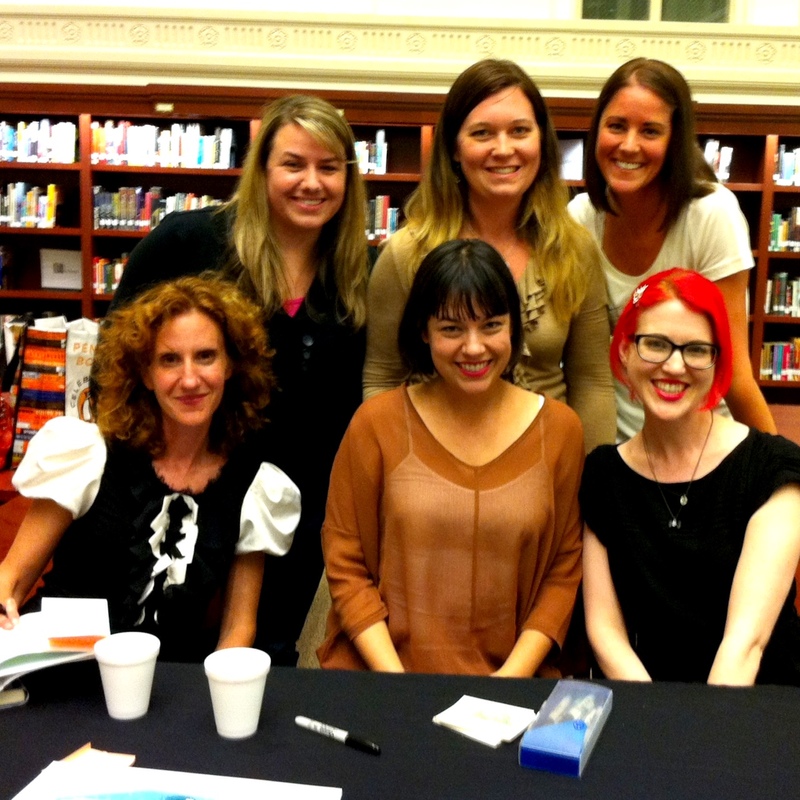 My good friends (and enthusiastic YA readers!) Kari, Theresa, and me, with Gayle Forman, Nina LaCour, and Stephanie Perkins. I was thrilled to meet Gayle, Stephanie, and Nina, and I’m grateful to them for sharing their wisdom and experience with readers and writers and fans (and for signing my big ol’ stack of books!). If you’ve slacked on reading any of their novels, please RUN to your nearest bookstore or library and hunt them down. They will change the way you read, and they will change the way you write. Tell me: What YA novel has changed the way YOU write? After reading Janice Hardy’s blog for years, when I read her debut novel The Pain Merchants (US title The Shifter), everything she’d been talking about finally clicked for me. I can’t say whether it was her blog or the book that changed the way I write/think about writing, but the novel definitely cemented what I’d learned from her blog either way. I haven’t read Janice Hardy, but knowing that she had such a huge impact on your writing makes me want to. I’m just here to say…I read IF I STAY 2 years ago (was it 3? – whenever it came) and was completely surprised by myself. I was expecting badly written, eh whatever book for a rainy day. No. I ended up reading IF I STAY in 2 hours and then spent the NEXT TWO hours in B&N crying. That’s when I knew I had to buy/keep/own forever IF I STAY. I loved WHERE SHE WENT as well (um…the bowling alley they speak of is *right next to* the terminal of my bus to go home from NYC lol!!!!). I am a little nervous for Gayle’s new books – that they won’t hold up to IIS/WSW, but I know definitely I am going to read them. Yes, BEFORE I FALL is amazing! It showed me how entertaining a novel set pretty exclusively in high school can be. And IIS and WSW both completely blew my mind. I LOVE those books! They made me want to write stories that pack the same emotional punch… definitely something to strive for! JEALOUS!!!!!!! I love all of these authors. So.much. I don’t think I can pinpoint just one or two books that have influenced the way I write. I’m influenced by just about *everything* I read, I think. I’ll learn a new technique from one or get the courage to experiment with POV from another, and along the way I find my own true voice. I’m influenced by everything I read as well, Meredith, both good and bad. There’s definitely something to be learned from every book, and like you said, reading widely is huge in finding your own true voice. The book for me was Lord of the Rings. I read it for the first time in 8th grade and thought, I want to do that, and that’s when I started writing my first fantasy story. My current WIP started off as that story originally, but it’s changed so much over the years, they don’t even remotely resemble each other anymore. Also, your pictures and this post make me so sad I couldn’t go! I wish you could have come, Stephanie! I left feeling so happy and inspired, and I learned so much. And I know what you mean about stories morphing over time… Totally been there! Jaime, I am 100% confident that you will love Gayle Forman’s and Nina LaCour’s work. They’re the same upper contemporary YA as Stephanie Perkins’ books, and they have similar honest, unflinching voices, and fantastic romances. Must read, all of them! It really was amazing. I learned so much, and I left feeling inspired and really excited about writing. I highly recommend seeing any or all of these authors if the opportunity presents itself. This was one of my very favorite book signing events ever. These women are such amazing writers and had so much wisdom to share! At our panel Gayle shared the advice be true to your voice, and I really liked that one a lot. If your writing voice is that of a 15 year old valley girl, that doesn’t mean you can’t write an amazing story. Don’t try to force your voice, just use it to tell the story you want to tell. Such great advice! That is fabulous advice… love it! Gayle, in particular, seemed so wise and full of amazing information. 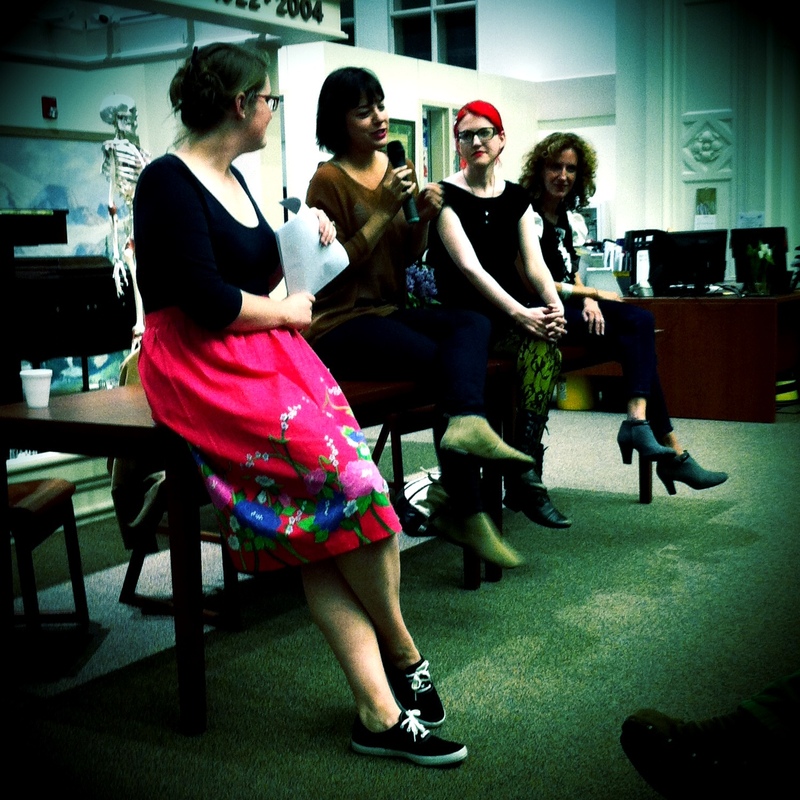 I learned so much from all three authors though… I could have sat and listened to them talk all night! Oh, I love our picture. 🙂 That was such a great event, especially since it was more intimate and since these authors were so charming–they didn’t disappoint! One book that changed me as a reader (not a writer, here) was SPEAK, which I read in college. As a future teacher I thought, my students will *need* to read this book because it’s so authentic and the voice is so true-to-high school… plus, it’s just wonderfully written. I didn’t know books were being written for “YA” and didn’t know that they were that good! More recently I had my world rocked by THE FAULT IN OUR STARS. I had read WILL GRAYSON, WILL GRAYSON but TFiOS really made me feel something in my core; it was a book that made me evaluate my life and illness, and even made me think about the structure of writing/POV with the last line, etc. Such a gifted writer. Okay, I still haven’t read SPEAK. That’s horrible, I know, and I’m currently hanging my head in shame. Must remedy soon! But yes, TFIOS was awesome, definitely! I want to tele-transport those three amazing ladies to Germany for an event 😀 It really looks like a lot of fun and full of important advice! I haven´t read Gayle Forman´s books yet but IF I STAY is very high on my TBR.. It is hard to choose just one. I’m the same way: I think I’m influenced by every author I read, whether I love their book or feel indifferent. There’s always something to learn! So jealous! Sounds like an amazing event! I haven’t read The Disenchantments, but I love the other two authors. 🙂 I REALLY want to meet Stephanie Perkins someday! You always ask such good questions on your blog! I have been trying to think of what YA novel changed the way I write. I initially wanted to write chick lit like 10 years ago, so a lot of those books come to mind. Also, it’s not YA, but Emily Giffin’s books, especially Something Borrowed, have impacted me as a writer. I really like her writing style, and the way she develops characters. But as for YA, I would say Along for the Ride by Sarah Dessen or Anna and the French Kiss by Stephanie Perkins. I’m a fan of Sarah Dessen as well. I write contemporary that’s sometimes lacking in a “Big Idea” and her books have shown me that stellar writing and awesome character development can overshadow a big hook. There’s hope for us contemporary gals yet! I’d have to say Deb Caletti. Hers were among the first YA books I read as an adult, and they made me fall in love with the genre. I now write contemporary YA too and hope my book is half as good as hers! I enjoy Deb Caletti for the same reason I love Sarah Dessen: Her work is all about real life and real teens. Plus, her books are beautifully written.